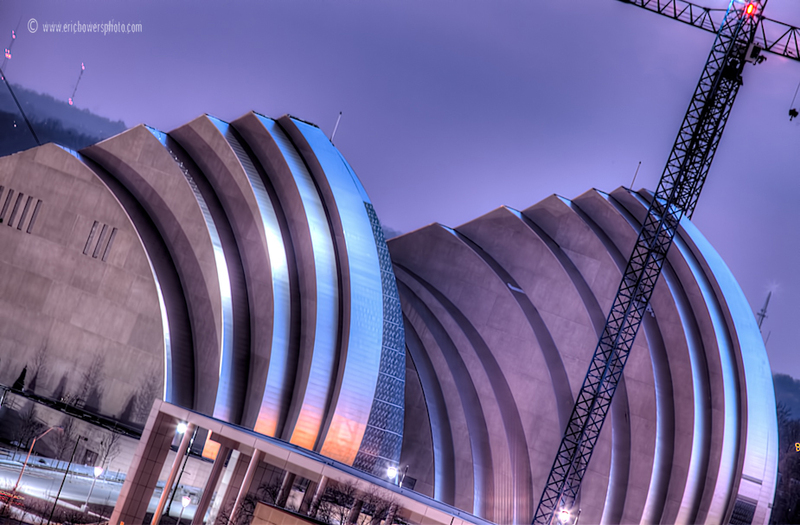 Sunday night on top of the City Hall garage with the Kauffman Center. The caption is right. That’s how I live life. A quick project I’m working on briefly has taken me back to the top of the city hall garage for a couple of recent sunsets. This shot of the old Power and Light Building with the H&R Block Headquarters and the Bartle Hall pylons (technically called Skystations I believe) was something additional I noticed while up there, and thought it would be fun to shoot at the end. Just for laughs I took an iPhone photo of my big camera rigged after I took this one. Because of the very high guard rails on newer garages like the city hall garage, I had to raise the tripod about a foot higher than my head and compose the shot looking up at the live view function on my camera’s LCD. I took five exposures at one stop apart each bracketed manually for eventual HDR work on the photo to get the evened out colors and tones in the sky. Getting the photo in the lovely City Hall Garage. 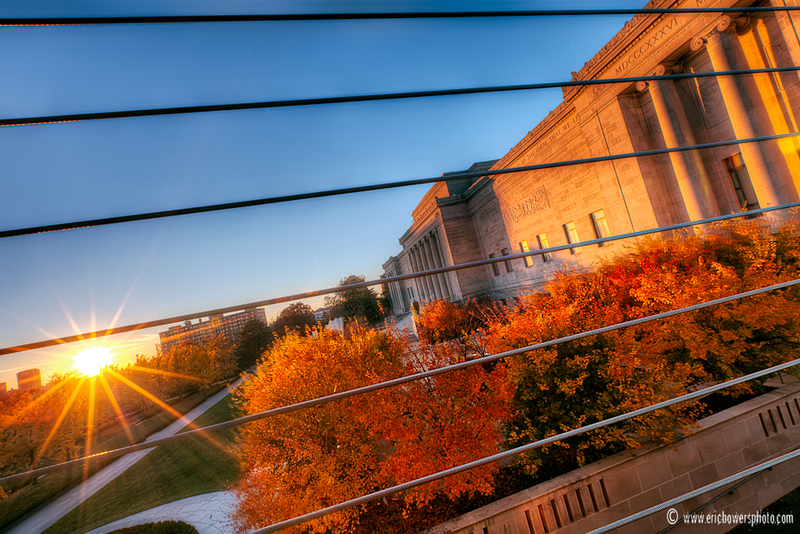 The Nelson Atkins Museum of Art at Sunset in the fall of 2010. Photo at the Nelson Atkins Museum in Kansas City on Tuesday, Nov. 16. Two or three times I’ve ambled around trying to get one or two decent fall shots this year, finally settling on this one. As I’ve noted, I’ll be having a gallery show and sale coming up Friday, December 3rd, and my gallery dude over at The Hook in Westport said I should make a point to get a fall foliage photo to include with the other stuff on the wall – which will be an assortment of Kansas City skyline scenes, Kauffman Center progression, and Plaza Lights shots in keeping with the time of year. Basically a big replenishing my outdated stock at The Hook. Like I noted in my Tuesday posting, come by the show if you’re looking for something to see or some shots to buy. The Hook Gallery is located in Westport near Californos and Murray’s, in the “Horseshoe” area of retail shops at 4120 Pennsylvania, KCMO (map). 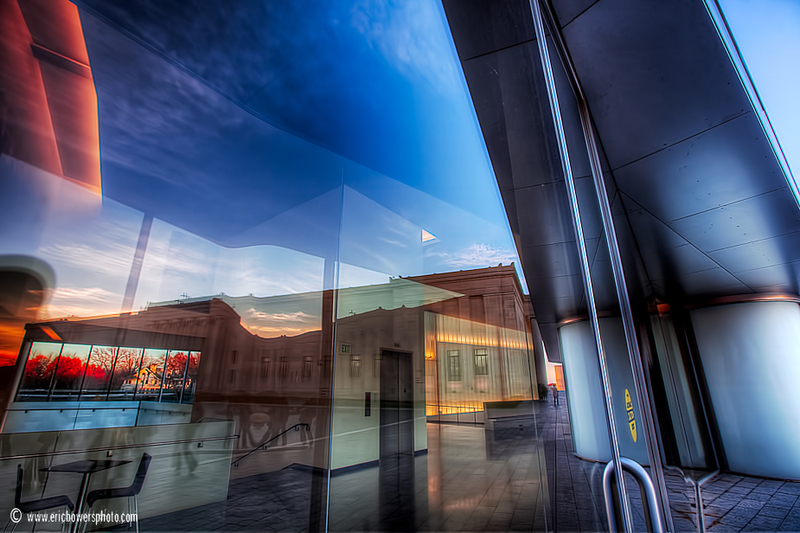 Nelson Atkins Museum with reflections in the Bloch addition glass. Announcing a photography art show on the evening of Friday December 3rd at The Hook Gallery and Framing event space (map, website) in the Westport “Horseshoe” near Californos and Murray’s. 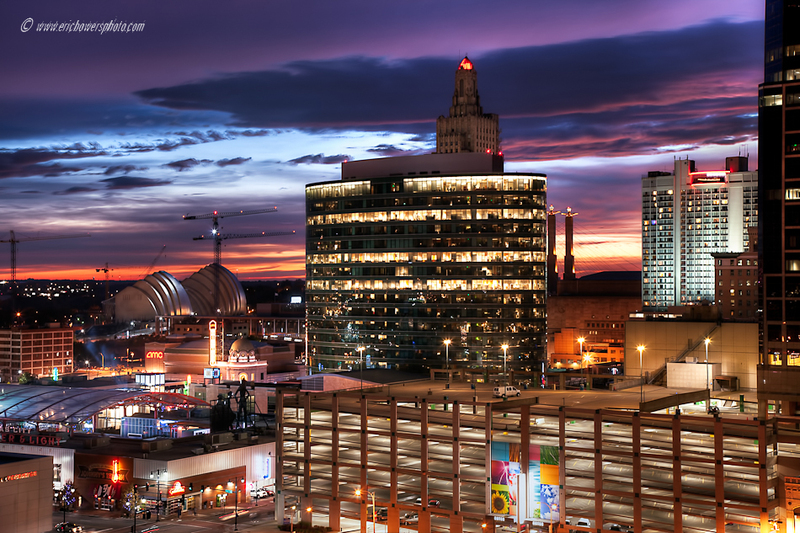 We’re replenishing the outdated stock of my wares therein and will be showing some Plaza Lights photos in the spirit of the season, as well as sights like the Kauffman Center’s progress and its change on the Kansas City skyline so far this year. There will be lots of new matted and framed prints, and custom orders for specific sizes and matte/frame combinations will be taken as well. Please, everyone feel welcome to come by and bring your friends too. With digital photography there are a lot of online/Facebook/Twitter buddies out there too so it would be a fun meeting face to face. On this photo above – On Monday evening at the Nelson Atkins Museum I was working with the Visitor’s Association to help them get some customized shots on the grounds centering on the new Bloch addition. While preparing and while we were waiting for just the right light, I thought it would be fun to slip on the wide-angle lens again and do another glass/architectural reflection type of thing I’ve come to enjoy doing recently. Here we can kind of see both parts of the interior and exterior of the Bloch addition, with a nice sunlit reflection of the original 1930s building in the glass. 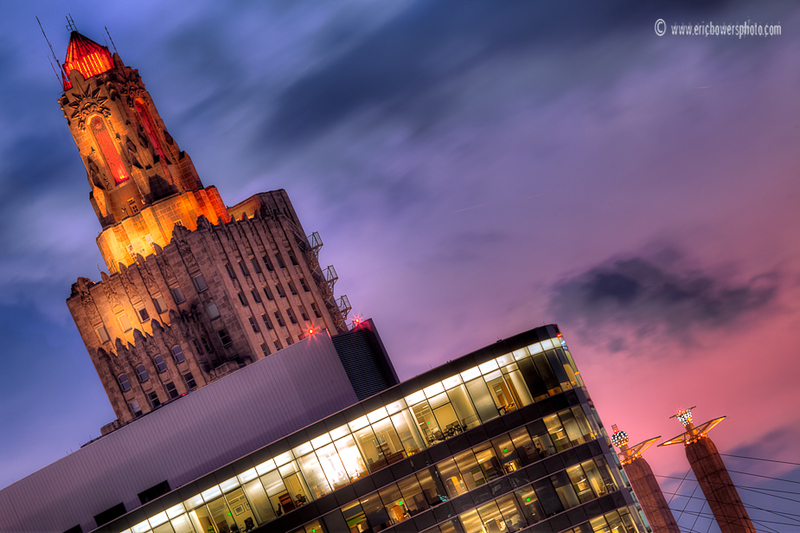 One more shot from the top of the City Hall parking garage looking west right after sunset. It was good and colorful last Saturday evening when I took this. Unfortunately so much of the urban parts of Kansas City have been gobbled up by parking, it can be hard getting a good shot of things that aren’t parking structures or lots – all the more ironic since it’s convenient to go to the top of garages to get elevated views. But only to a point apparently – too many garages everywhere and there’s nothing left worth looking at. Since the City Hall garage is rather new, it has very high guard rails making it about impossible to take a picture through the camera’s viewfinder. 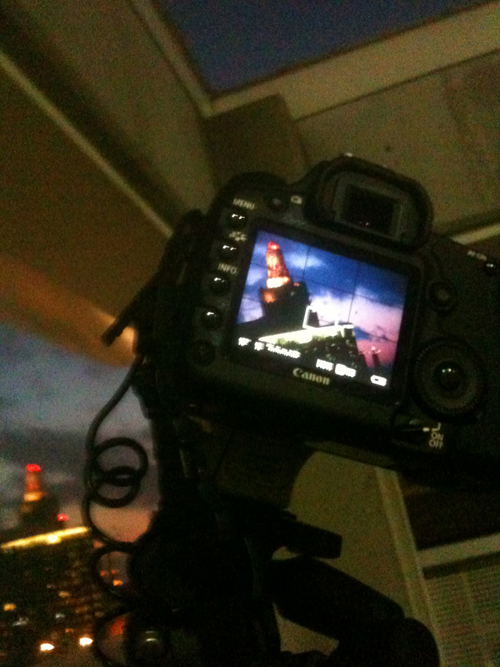 For this one I had to activate the Live View mode so I could see the visual on the camera’s LCD and prop it up high with my tripod, and manually bracket my shots looking at the light meter display on the LCD. So that’s one other advantage of my Canon 5D Mark II – as much as I loved my old original 5D I couldn’t have gotten this shot with it.